Quetzal is a jock, eagle villager from the Animal Crossing series. His two appearances were in Animal Crossing and Dōbutsu no Mori e+. His name comes from quetzals, a bird native to the Americas, although quetzals are green, tropical trogons rather than eagles. This ties in with the Native American-style warpaint he appears to have on his cheeks. 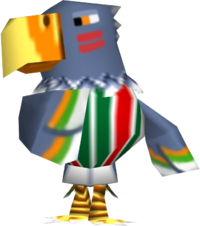 Quetzal is a gray eagle that greatly resembles a Native American, similar to Leigh, a peppy chicken villager, and has red war-paint on his cheeks, while also having green and orange striped tips at the end of his feathers. His orange beak is also tipped yellow at the end and along his nostrils. Quetzal also has black eyes with orange irises that appear stern, representing his determined personality. His initial clothing is the Rally Shirt. Quetzal is a jock villager, meaning he will like to talk about muscles and exercising. Quetzal will not get along with lazy villagers, due to their conflicting lifestyles, and will also question snooty villagers on their weight, offending them. He hates to admit it, but Quetzal is really into interior design. He claims he just likes moving his furniture around because it helps him keep in shape, but that's just a cover story. An official wallpaper for Animal Crossing depicting the eagle villagers. Modified on March 11, 2019, at 23:11.